Town of eastern Rumelia or southern Bulgaria. According to tradition, Jews first established themselves at Carnabat about 1580; but the oldest tombstones decipherable bear date of 1686. 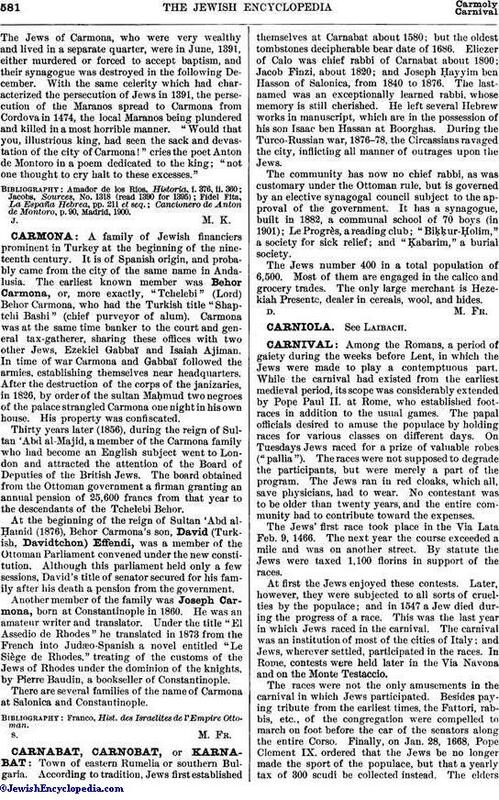 Eliezer of Calo was chief rabbi of Carnabat about 1800; Jacob Finzi, about 1820; and Joseph Ḥayyim ben Hasson of Salonica, from 1840 to 1876. The last-named was an exceptionally learned rabbi, whose memory is still cherished. He left several Hebrew works in manuscript, which are in the possession of his son Isaac ben Hassan at Boorghas. During the Turco-Russian war, 1876-78, the Circassians ravaged the city, inflicting all manner of outrages upon the Jews. The community has now no chief rabbi, as was customary under the Ottoman rule, but is governed by an elective synagogal council subject to the approval of the government. It has a synagogue, built in 1882, a communal school of 70 boys (in 1901); Le Progrès, a reading club; "Biḳḳur-Ḥolim," a society for sick relief; and "Ḳabarim," a burial society. The Jews number 400 in a total population of 6,500. Most of them are engaged in the calico and grocery trades. The only large merchant is Hezekiah Presente, dealer in cereals, wool, and hides.